Last month I met up with an old friend I hadn’t seen in forever to have lunch. Having both read and written about how to be an effective and charismatic conversationalist, I followed the old dictum of listening more than talking and asking the other person engaging questions about themselves. This is supposed to charm your conversation partner. I guess it worked because my friend talked about himself for an hour straight and didn’t ask me a single question. When we’ve talked about the ins and outs of making good conversation before, someone inevitably asks, “But what if both people keep trading questions back and forth?” Well, that’s a pretty good problem to have, but I’ve yet to see it happen. Instead, most folks seem to struggle with asking any questions at all and have a very difficult time relinquishing the floor. In a time where a lot of the old social supports people relied upon have disappeared, people have become starved for attention. They bring this hunger to their conversations, which they see as competitions in which the winner is able to keep the attention on themselves as much as possible. And this is turning the skill of conversation-making into a lost art. So today we’re going to discuss the ways in which conversational narcissism creeps into our interactions with others. While it may seem a bit strange that conversations can be analyzed this deeply, Dr. Derber’s research is filled with some really brilliant insights that will help you see how a conversation unfolds and how you can easily fall into the conversational narcissism trap. I know it did for me. Before we get into the forms that conversational narcissism takes, let’s take a minute to discuss why you should even care about the health of your conversations in the first place. You probably know how mastering the art of conversation is an invaluable tool in building your charisma and networking with others, whether it comes to business or pleasure. But it’s also a vital part of fulfilling a deep human need we have as social animals. Have you ever had a night out with friends, maybe you met up at a new restaurant, had a few beers, and ended up talking and laughing the night away? As you walked to your car, I bet your brain felt positively aglow with a warm sensation of deep satisfaction and pleasure. That’s the effect a great conversation can have on you. Absorbing conversations truly add happiness and richness to our lives. But the enjoyment of a good conversation is becoming more of a rarity these days. In our time of cell phones, text messaging, and emails, we’re having less face-to-face interactions, and thus when we do meet up with people in the flesh, our social skills can be a bit rusty. So we can all use some brushing up on the art of conversation and how to make great conversations a more frequent occurrence in our lives. A good conversation is an interesting thing; it can’t be a solely individual endeavor—it has to be a group effort. Each individual has to sacrifice a little for the benefit of the group as a whole and ultimately, to increase the pleasure each individual receives. It’s like a song where the rhythm is paramount, and each person in the group must contribute to keeping that rhythm going. One person who keeps on playing a sour note can throw the whole thing off. That’s why it’s so important that conversations are cooperative instead of competitive. But many people (and Dr. Derber argues, Americans especially, because of our culture of individual initiative, self-interest, and self-reliance) make conversations into competitions. They want to see if they can get the edge on the other people in the group by turning the attention to themselves as much as possible. This is accomplished through the subtle tactics of conversational narcissism. So let’s get down to the nuts and bolts. How does conversational narcissism rear its head and derail what could have been a great face-to-face interaction? During a conversation, each person makes initiatives. These initiatives can either be attention-giving or attention-getting. Conversational narcissists concentrate more on the latter because they are focused on gratifying their own needs. Attention-getting initiatives can take two forms: active and passive. James: I’m thinking about buying a new car. Rob: Oh yeah? What models have you looked at? Rob: Oh yeah? I’m thinking about buying a new car too. Rob: Yup, I just test drove a Mustang yesterday and it was awesome. In the first example, Rob kept the attention on James with his support-response. In the second example, Rob attempts to turn the conversation to himself with a shift-response. James: Really? Maybe we could go look around together. Rob: Sure. So what models are you looking at? James: That’s the thing—I’m not sure where to start. Rob: Well, what are the most important things to you—fuel economy, storage room, horsepower? Rob: Sure. I just test drove the Mustang yesterday and it was awesome. James: That’s cool. I don’t think I want a sports car though. Rob: Well, I want something with at least 300 horsepower and definitely leather seating. Did I ever tell you about the time my buddy let me take his Maserati out for a spin? Now that is an automobile. James: Which one of your friends has a Maserati? To summarize, it’s fine to share things about yourself, as long as you loop the conversation back to the person who initiated the topic. The best rule to follow is simply not to jump in too early with something about yourself; the earlier you interject, the more likely you are to be making a play to get the attention on yourself. Instead, let the person tell most of their story or problem first, and then share your own experience. Conversational narcissism can take an even subtler form. Instead of interjecting about themselves and trying to initiate a new topic, conversational narcissists can simply withhold their support-responses until the other person’s topic withers away and they can take the floor. A conversational narcissist can kill someone’s story dead in its tracks by withholding these support-responses, especially by not asking any questions. Etiquette dictates that we don’t ramble on and share every detail of a story right off the bat. We say a bit, and then wait for further questions, so we know that the person we’re speaking with is interested in what we have to say. In the absence of such questions, the speaker will begin to doubt that what they’re saying is interesting. So they’ll stop speaking and turn the attention to the other person. A victory for the conversational narcissist. 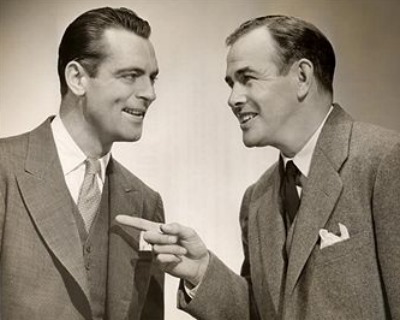 Conversationalist narcissists will also show their disinterest in the speaker by delaying their background acknowledgments–those all important “Yeah’s” and “Hmmm’s.” Good conversationalists place their background acknowledgments in just the rights spots, in the small natural pauses in the conversation. The narcissist tries to adhere to social expectations by giving the speaker some cursory acknowledgments, but they’re not really listening, and so they throw them in there just a few seconds off. The speaker easily picks up on this skewed-timing and will stop talking and shift their attention to the narcissist. Finally, one more form of conversational narcissism to avoid is the “Well, enough about me, I want to hear more about you!” tactic. People will often pull out this kind of line right at the end of an event, so they can make a show of etiquette and interest in the other person, while not actually having to give that person attention that lasts more than a few minutes. Avoiding these pitfalls of conversational narcissism will have you well on your way to becoming a competent and charismatic conversationalist. Once someone introduces a topic, your job is to draw out the narrative from them by giving them encouragement in the form of background acknowledgments and supportive assertions, and moving their narrative along by asking supportive questions. Once their topic has run its course, you can introduce your own topic. But as we mentioned earlier, it takes two to tango. It’s now your partner’s turn to ask you questions. If they don’t, you’ll sadly find yourself, as I did at the lunch with my friend, listening to a never-ending monologue. Just smile and enjoy the chips.